Froddo is a Croatian brand. Froddo is producing shoes that cares about the environment, as well as the health of children. All the footwear is anatomical and made of soft natural leather which protects the feet and provides them with natural development. Modern Finnish waterproof footwear for children. Winter shoes Kuoma are extremely warm and extremely comfortable. All products have a durable shock absorbing outsoles, which "works" even in cold winter conditions. In addition, the shoe is equipped with a removable insoles and reflective strips to improve safety. Bebetom company successfully works in the global footwear market for over 10 years. In the production of shoes is used only natural leather. An important advantage of this shoe is the presence of multi-layer soleplate, which helps to prevent fatigue of the feet during walking and running. Minimen specialty is that the sandals and sneakers have heel stabilizer and ortopedic leather insole. Minimen footwear provides comfort and support. Wearing footwear with these two technology allow your children feet to maintain the correct or natural shape while wearing them. In almost half a century of history, Canguro has become synonym of Italian Style, a value universally recognized, in which tradition and innovation are complementary elements of one of a kind creativity. A value that, in spite of global competition, is always on the grow and represents a key winning factor towards competitors. Canguro shoes are produced from different materials and they have wide range of shoes. Even the most demanding customer finds suitable shoes from the Canguro collection. Shagovita produces footwear only using soft natural leather. Shagovita children shoes are anatomical and with a heel stabilizer. These two important features make the children footwear light and comfortable for everyday use. Disney is an Italian brand. Disney children shoes have depicted all the children favorites and the famous Disney characters. Disney children footwear can be purchased at an affordable price, so that all the small fans of Disney can include their favorite characters to their everyday activities. Strollers is a Finnish brand, which creates a light and high-quality shoes. Strollers shoes are made of different materials. Strollers children footwear is suitable for everyday use. Strollers children footwear is comfortable and can be purchased at an affordable price. Estonian company that continues family shoemaking traditions which date back to 1927. Production facility is located in Kirumpää, near the city of Võru, where company manufactures sandals, indoor slippers, as well as children's and gymnastics shoes. Products are manufactured from natural materials, and during production is used environmentally friendly technology. Gym shoes manufactured in Estonia. Shoes suit for dancing and rhythmic sport gymnastic. Manufactured from natural materials, and during production is used environmentally friendly technology. 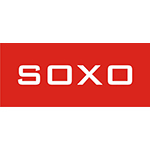 SOXO is the leading manufacturer of socks, slippers and textile accessories for babies, children, women and men. In production is ared used only the highest quality materials, providing the highest quality products. SOXO socks and slippers are soft, warm and comfortable.